What do you do about all of your phone’s photos? If you’re like me, you just keep adding to your Camera Roll with no plan or organized system of any kind. I know at some point, I’m going to run out of space. Picture Keeper is a tiny but powerful option for photo backup – it saves your photos and frees up the space you need on your phone for apps and other items. It’s a tiny zip drive so it’s easily stored and doesn’t take up much room in your house! 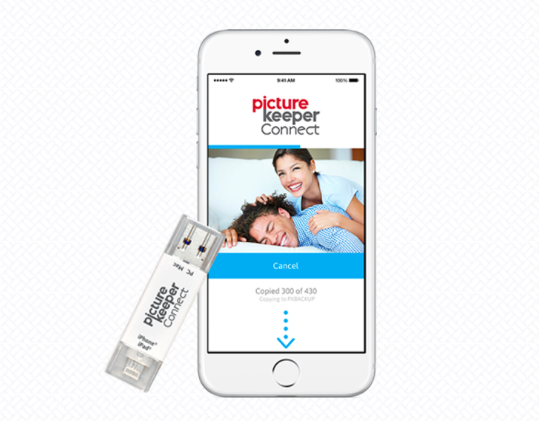 Using the Picture Keeper free app from your appropriate app store, it pulls and saves all of your photos with little work needed from you. Sweet! I believe I paid for one of these and never received it. Can you find my request? I am part of the Picture Keeper team and wanted to let you know that we are happy to help. Please contact support at http://www.picturekeeper.com/support or call 1 877-382-0949 and they will be able to track your order. Thank you!